Isami Doi was active/lived in Hawaii, California. Isami Doi is known for figure-genre, abstraction, graphics. Seller's Notes/Description: ***To our valued customers: After 7 years at our gallery at 2005 S. King Street in Honolulu, Hawaii, we have decided to close the gallery and move to a downtown office and focus on online/appointment-only sales. This is a once-in-a-lifetime opportunity for you to get our rare artworks for 35% OFF regular price. EVERYTHING MUST GO! Please contact us at 808 941-4901 if you have any questions or would like to purchase one of our pieces. 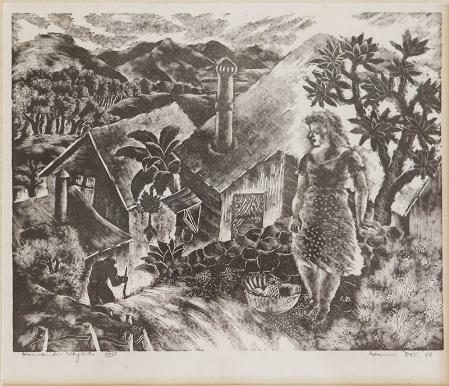 *** - Hawaiian Wayside, , 9" x 7", circa 1940, stone lithograph. Archivally framed in a superb, genuine curly Koa wood frame and ready for hanging. Pencil signed and dated by the artist. - Isami Doi 1903-1965 was born on Oahu to Japanese immigrant parents. After growing up on Kaua&apos;i, he attended the University of Hawaii for two years, and then Columbia University. In 193, Doi returned to Hawaii, where he taught printmaking, drawing, and metal work as well as designing jewelry for the S. and S. Gumps store in Waikiki and turning out numerous woodblock prints and paintings of his own. Doi is credited with inspiring an entire generation of Hawaiian/Japanese artists, including Satoru Abe, Bumpei Akaji, Jerry Okimoto, and Tadashi Sato.